HARRISBURG, Pa. -- Two former Penn State University administrators each pleaded guilty Monday to a misdemeanor child endangerment charge for his role in the Jerry Sandusky child molestation case, more than five years after the scandal broke. Ex-Athletic Director Tim Curley and former university Vice President Gary Schultz originally were charged with felonies. The reduced charge is punishable by up to five years in prison. Penn State ex-President Graham Spanier was also charged in the case. He was not in the Harrisburg courtroom Monday morning, though his attorneys were. The three handled a 2001 complaint by a graduate assistant who said he saw Sandusky, a retired defensive football coach, sexually abusing a boy in a team shower. They did not report the matter to police or child welfare authorities but told Sandusky he was not allowed to bring children to the campus. Sandusky was not arrested until a decade later. He was convicted in 2012 of 45 counts of sexual abuse of 10 boys, and is serving a 30- to 60-year state prison term. Shortly after Sandusky's arrest, Hall of Fame football coach Joe Paterno was fired. 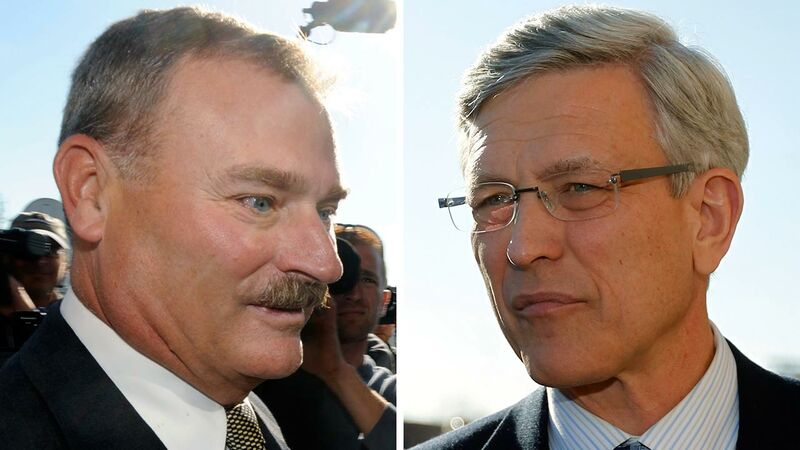 Schultz and Curley were arrested in 2011, and Spanier in 2012. The three former administrators at Penn State's flagship campus in State College had also faced charges of conspiracy. Each felony count carried the possibility of seven years in prison. Their case has dragged on for years because of a dispute about their representation during a grand jury appearance by Penn State's then-chief counsel Cynthia Baldwin. That legal fight prompted the Superior Court decision that threw out several charges, including perjury and obstruction. The scandal's overall cost to the school includes a recent $12 million verdict in the whistleblower and defamation case brought by former assistant coach Mike McQueary, the ex-graduate assistant whose testimony helped convict Sandusky in 2012. The NCAA also levied a $48 million penalty against the university that is now funding anti-child-abuse efforts in Pennsylvania. McQueary went to Paterno's home a day after the shower encounter to discuss what he had seen. Paterno alerted Curley, the athletic director at the time, and Schultz, a vice president at the time. McQueary met with both of them about a week later. Nine years later, an anonymous email sent to a district attorney led investigators to first approach McQueary in the case. Paterno's handling of the complaint was eventually cited by trustees as one of the reasons he had been fired in late 2011. Paterno died a few months later. He was never charged with a crime.